I am in an airport, on my way home from the first of three trips to the Midwest in an unexpectedly busy month of travel. This airport is relatively pleasant, as airports go: spacious, free wifi, not too crowded, decent food options. Wish we had more airports in NYC that met those criteria, but of course I really wish that I could take a high speed train to these places instead of flying. These trips are all for good things, family and work and family and vacation (in chronological order). It’s busy, though, and there’s a part of me that wishes I could spend the next month snuggled on the sofa with the kittehs reading books (I have some reading goals this year that I’m already behind on), or finding enough fire lizards that I can trade them in for a fireproof tunic to make it to Goron City. 2019 has snuck up on me a bit. It’s a big year in life stuff that I’m only just now starting to understand is a big year. These 3 trips can sort of be characterized as the past, present, and future: my first trip back to my father in law’s house since my mother in law died; a conference where I’ll present a paper (followed closely by a presentation on my research at a dinner for an award I just won at work, which took me very much by surprise); and attending an accepted students program at a college my teen is seriously considering (plus some extra vacation days). The nostalgia of aging has also really snuck up on me. Music has been an especially intense time travel drug recently. How is it possible that the songs I love in the Captain Marvel movie are 25 years old? And this song, released just this year, which I’ve been unable to stop listening to because it evokes a time in my life that seems so recent but is actually, literally, no joke half my lifetime ago. So many feelings, I don’t even know what to do with all of these feelings. I’ve been dragging my feet a bit writing my annual reading roundup this year. Some of my hesitation stems from pure envy (owning it! ): a pal read 100+ books (!) in 2018 and while they have a different sort of commute than I do, I still fall into that grass is greener mentality easily when it comes to reading. Librarian stereotype, it me: I really love to read, and I really wish I could read more without having less time for the other things I need + want to do. I also feel kinda bummed that I wasn’t able to get through all of the books I own and have been meaning to read. Some of this is for sure the fault of being led astray by other books (oh books, you’re so pretty! ), some from the library and some not. And I’ve actually tried to stop myself from reading new book reviews until I’ve gotten the piles* of unread books under control. But also I was busy last year, and for sure 2017’s count was inflated just by virtue of my 6 months on sabbatical. Admittedly I have had a really hard time reading recently. I’m not sure exactly why — I pick up a book that seems interesting and I get a few pages in and then I just slow down. I only started + dumped 1 book this year, but it’s just taken me ages to get through many reads. It has been a superbusy year: hired 5 folks at work + did the college application (!) thing + wrote up my sabbatical research. So perhaps unsurprising that I fall asleep many nights after only reading a page or two. Having thoroughly moped out in this post so far (whoa, sorry for the downer), I will say that there’s some amazing stuff on my list from last year. Both So You Want to Talk about Race and White Fragility were transformative; the former was so good that I bought it after borrowing it from the library, and the latter was so good that I blagged about it over at the academic librarianship place where I’m a blogger. I was delighted that the kid read So You Want to Talk about Race too, initially over my shoulder when we were on an airplane and later finishing the whole thing after I did. I also feel good about having read a few classics that I’d never read before, especially Frankenstein and The Fire This Time, which were both amazing. I think for next year, in addition to getting through the piles, I’m also going to try and get to other classics that I’ve somehow missed to this point, especially those written by women and BIPOC. I made a big push to read more of the library or otherwise work-related books in my pile this year and it definitely shows. Algorithms of Oppression is the standout — disturbing and necessary, and I’m still chuffed from getting to introduce Safiya Noble at the CUNY IT Conference in December 2017. :) The Self as Subject was a somewhat indulgent delight — being a part of this book project is one of the best academic experiences I’ve ever had, and I was delighted to read everything that we were all able to write for this volume. Emergent Strategy was also terrific and, while perhaps not exactly work-related, is definitely a book I’ll return to as I keep learning and thinking about how libraries can help us get to a just future for everyone. Started not finished: The Third Hotel by Laura van den Berg — I liked her first book but this one just didn’t grab me. It’s another quiet holiday break for casa mauraweb, for which I’m again grateful. We’ve done some xmasy things and some family visiting and saw some art and ate good food and have more good food and friends events planned for the next few days. I’ve also gotten some writing off my plate, which was needed and is making me feel better about the several (sigh) deadlines I’ve saddled myself with between now and early February. Leaving town meant driving, so much driving, too much driving, it seemed to me. Though really any driving is too much driving for me at this point. I’m more prone to carsickness the older I get, and the nagging anxiety I have about climate change (and the role of cars and driving) has gotten louder this year for sure. It’s tempting to blame the recent report from the Intergovernmental Panel on Climate Change which revealed that warming is happening more quickly than (some) originally anticipated. But really my increased unease dates to my reading of this summertime NYT magazine article Losing Earth: The Decade We Almost Stopped Climate Change. You might want to read it, though you might not, depending on your personal threshold for retroactive anger and despair. Because wow, my fighting against despair brain is all about alternate timeline fantasies right now. What if all of those efforts in the 80s had worked to create policies that would slow down global warming? What if Al Gore had actually been allowed to take office? What if the US hadn’t invested so heavily in cars and highways at the expense of public transportation and trains? And the worst kicker, the ultimate gut punch, what if we had a federal government that was interested in figuring out how to deal with climate change rather than actively, cravenly, corporate-greedily speeding it up? It all makes me angry in small ways as well as big ways. I have to travel to Cleveland for a conference next year, and I keep looking at train and bus routes trying to figure out some non-ridiculous way to get there without flying which just does not exist, no matter how many times I check the maps and schedules. Jonathan told me the other day that apparently the distance between Beijing and Shanghai is similar to that between NYC and Chicago, and there are 39 trains each day between the two cities, a ride that takes 4 hours. FOUR. HOURS. We took the train to Chicago once in the 90s; it took 18 hours (in the regular seats, not the sleeper compartments, because grad students) and also broke down and we had to change to a new train. But we got to see Neil Young eating in the dining car, because he apparently doesn’t fly, so yay? The big ways are the scarier ways, of course. What will happen, and when? Unpredictability of weather and other natural disasters, for sure. Should we move? Should we not move? Who can tell? We don’t fly all that much, maybe a few times/year total for all of us for vacation/family visiting/work (just me). Should we stop flying completely? What else can we do? I firmly believe that we are outside of the realm of individual solutions, though I also think that as an individual I should keep on doing the things I’m doing already to reduce my carbon footprint. Ugh, I hate to end on a down note, but it’s hard to find climate-related anything to be hopeful about. I will say that I’m looking to get more active in climate justice work this year, maybe call it a resolution? And I’m cheered by the work of the young folks behind the Sunrise Movement. You may remember them occupying Nancy Pelosi’s office after the midterm elections, and they’re doing urgent work pushing for policy changes to mitigate the effects of climate change. If you’re looking to donate before the end of the year and are as freaked out as I am about climate change, maybe consider a donation to help them keep up their good work? I took a day trip to Philadelphia last week, down and back on the train (<3 the train), my favorite way to travel always giving me lots of thoughts to think. I’d taken a longer trip requiring several airplanes and airports the prior week, and while it was a good trip in so many ways (not least of which were the spectacular views out the airplane window) I will never not feel that train travel is the Most Ideal Way to travel. As the train gets close to Philly the gleaming new skyscrapers pop into view. As someone who spent their pre-college years mostly in the Philly environs those tallest buildings in the city will always be new to me, even though Wikipedia reminds me that the unspoken rule that no building should be taller than City Hall (lest it block the view of the William Penn statue on top) was declared passe in 1986 when the first building to surpass it in height went up. How can it possibly have been that long ago? The same year that I saw New Order at the Irvine Auditorium on the University of Pennsylvania campus, which I’d forgotten until I found myself standing next to that building last week. I’m feeling pulled in all the directions recently — middle age and imepending life changes making me look backward and forward, time feeling weirdly both fast and slow. 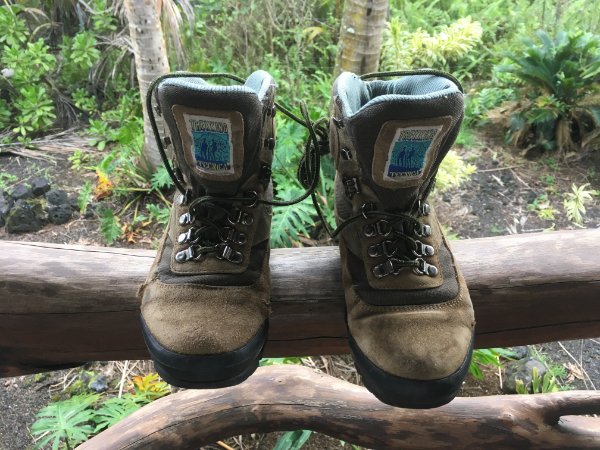 The impacts of budget shortfalls at work overfill my days, sometimes making me miss with an actual physical ache the slower pace I was able to have during sabbatical nearly 2 years ago. (How was that almost two years ago already?) I keep starting books and having to pause them for long periods which is not a good way to read, distracting and slow, always playing catchup. I write postcards and more postcards in support of Democratic candidates because that is the way I can be active in this last push before the midterm elections. Time for the good things is moving too fast, and too slow for the bad things. Aging, it’s a trip. I am trying to get back to videogames this summer. It seems weird to have to make a plan to do something I ostensibly enjoy, something that’s very clearly a leisure + fun thing, but here we are. I think I fell out of the habit of playing games kind of gradually over the past decade as my job really turned into my career. * Being on the tenure track for sure makes it easy to work lots and play little, and by the time I had tenure and was all the way promoted I was also library director which is a not un-busy job. The games I tend to like best are often long and rely on accumulated knowledge and skill, which is not necessarily conducive to intermittent play. Also I was listening to my favorite podcast Secret Feminist Agenda not long ago and in the episode on videogames they made the point that in our late capitalist era it seems like even hobbies have to be productive in some way. Like why is knitting held in higher esteem than playing videogames? Does everything we do have to result in a product? Even reading, which I adore, “makes” something in that you’re learning when you read, right? *Not that that wasn’t always the plan, because it was, but it still has come as a bit of a shock, I think in part because there seem to be fewer and fewer actual careers now (in any occupation) than there were in the past. Plus the whole problem of contingency in higher ed, declines in funding for public institutions, etc. just makes everything feel very precarious. Anyway, that’s a drag and videogames are fun, phfffft. Right now I’m playing the latest game in Nintendo’s Legend of Zelda series: Breath of the Wild. It’s the first fully open world Zelda game, and it is also super gorgeous, I have to say. I’ve always liked the Zelda games — they’ve been aesthetically pleasing and have long had a huge expansive landscape feeling even though they weren’t truly open world (meaning that you mostly progressed through the world on a predetermined path, plus diversions [called side quests]). I’m finding gameplay in the open world to be both intoxicating and distracting. At first I didn’t realize that you really can go anywhere — the visibility of the map is activated by visiting a tower in each map section, and I initially thought that I had to follow the overarching game quest to get to each section. Which would work, I assume, but once getting past the initial training level (which requires you to earn a paraglider to get down to the other regions) it’s also fine to just go wherever you want to. I’m still nearish to the beginning of the game, despite having played on and off for about a month. I’m probably moving more slowly through the game than is absolutely necessary, in part because I’ve been captivated by the cooking mechanic. Instead of cutting the grass or smashing pots to get life hearts, like in other Zelda games, in this game you find plant and animal foods (and can hunt animals as well) as you travel. You can eat any food raw, but you get more hearts and sometimes other special powers (stamina, strength, cold resistence, and others) if you cook the food first. There are cooking pots scattered across the landscape and whenever I come upon one I’m generally unable to resist cooking at least a few things. I’ve also been collecting rocks and weird monster body parts and apparently there’s a crafting mechanic too, but I haven’t done any experimenting yet to see what I can make. I’ll admit to having some trouble with the inventory process, which I think is also slowing me down a bit, especially when fighting enemies. As is common in many games (though not in prior Zelda games I’ve played), items like weapons and shields last for only a set number of uses before they break. Generally it’s been fairly easy to find weapons around the landscape or in treasure chests, and also when you kill an enemy you can take its weapon. But you can only hold a set number of weapons, and not every weapon is useful for every enemy (and also some things, like the sledgehammer, are needed to smash rocks to get flint and gems, so I’m hesitant to use them as weapons). Mostly the problem for me is that my weapon will inevitably break in the middle of a fight, and I’ll have to jump into the inventory and choose a new weapon quickly. Which is fine — the inventory screen is basically a pause — but I’m not supercoordinated about it and often get flustered and die (sometimes I also forget that I can replenish my hearts by eating food when in the inventory). I also get flustered fairly often with the range of buttons on the controller, though that’s not a new problems for me. The other thing that’s slowing me down is that it’s Just. So. Pretty. The landscape is mountains and meadows and forests and rivers and lakes and snowcovered peaks and ruined medievalish buildings and broken mosscovered vaguely steampunk robots. There are animals and birds and fish. There’s wind and rain and snow and lightning. The sun rises and sets. The mountaintops and towers have a realistic and genuine feeling of tallness, so much so that as a person who’s afraid of heights I sometimes I feel the tiniest bit woozy when I’m standing on a mountain looking out over the terrain. It was a busy spring, following a busy fall. Also everything is awful and that doesn’t seem to be slowing down. I’ve found myself thinking back lots recently to our spring break trip to Hawaii. Some of that is a “wow remember how lovely it was to be there and to relax and see neat stuff and eat good food and relax” kind of thinking. But most of it is a “wow where has the lava gone today?” kind of thinking. In mid-April volcanic activity and earthquakes started happening at Kilauea, and eruptions started in early May. It’s been super intense: fissures popped up in a subdivision east of the volcano and lava fountained up into the air and flowed down the streets and consumed a car and there’ve been ash and boulder explosions regularly out of Halema’uma’u crater and the lava flowed all the way to the ocean. When the eruption started it was in the news regularly here on the mainland, but it’s dropped off most people’s radar I think. Except that I’m a nerd and fascinated so I check the US Geological Society website every day to see what’s happening. They have a great, active Twitter account too. (Lol, inward slumping of the crater continues. I feel ya, Halema’uma’u.) Hawaii Volcanoes National Park has also been closed in that section for the past month or so (there’s a smaller section on the southern end of the island that’s open), including the lodge where we stayed. It’s a strange weird feeling to be watching this volcano situation. While dramatic, it’s not super fast moving or sudden, and thankfully no one has died (and I don’t even think many, if any, folx have been hurt?). 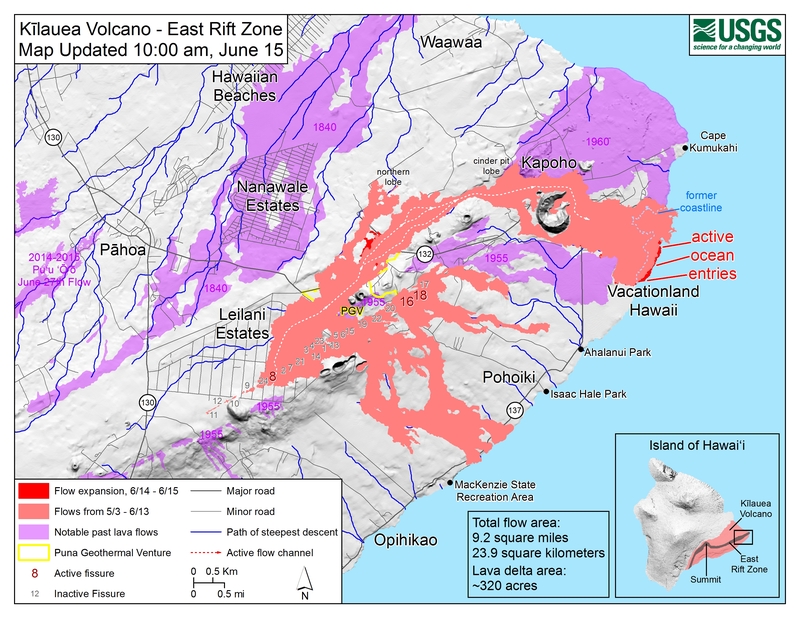 There has been damage to property — houses consumed by lava in the eastern part of that subdivision as well as a few other neighborhoods — though since that area (the Lower East Rift Zone) is fairly volcanically active there’s not a lot of housing there. On the other hand, houses have been destroyed and people are displaced, which is not good. Also destroyed were the tidepools at Kapoho, just south of Kapoho Bay, where we* snorkeled on the last day of our vacation. (*Except not me, because it turns out that for me snorkeling feels a bit like drowning. Not my jam.) The ocean entry of the fissure 8 lava flow is enormous and growing. The maps are a trip, on this one you can see the former coastline marked with a dotted line — everything east of that is new land, the earth just belching out a whole bunch of new land. It’s sad to think of the tidepools — they were beautiful (on the map they were just about where the line from the word “active” points to the shoreline). And the small neighborhood of big vacation houses just adjacent to the tidepools has been completely obliterated. It’s sad but fascinating, such a weird feeling. I keep tuning in every evening, checking on what’s happened in the past day. The earth is amazing.